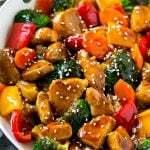 This teriyaki pork stir fry is pork tenderloin seared to perfection with colorful vegetables in a homemade teriyaki sauce. A fresh and healthy meal that’s ready in just 30 minutes. 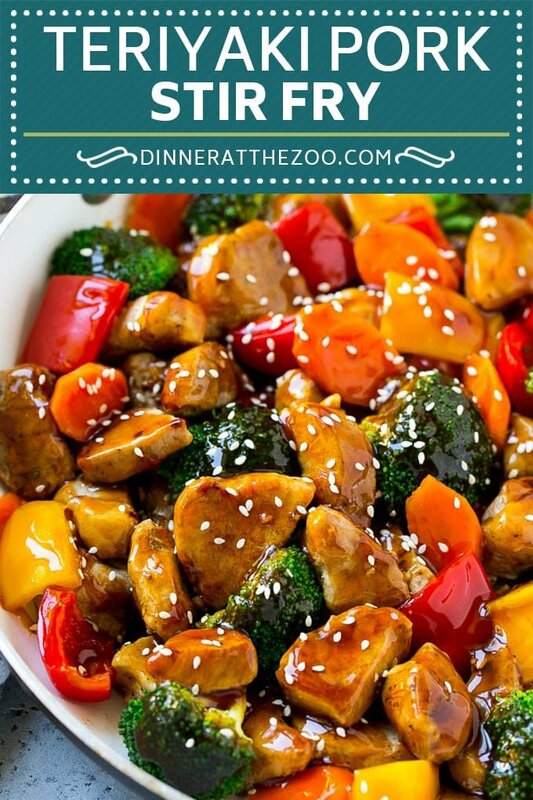 We eat a lot of stir fries in my house, and this easy and satisfying pork stir fry is one of our favorites. So many amazing colors, flavors and textures all in one dish! I don’t think we ever go a week without at least one type of stir fry popping up as a dinner dish in this house. 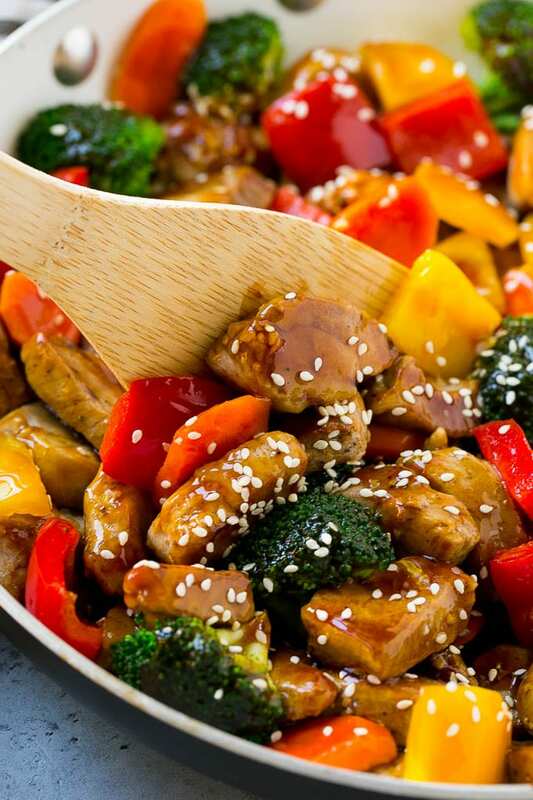 One of my personal favorites is this teriyaki pork stir fry. It’s such an easy and satisfying dish and it’s on the table in less than 30 minutes. The best part of this dish is how fresh and healthy it is. It’s full of assorted vegetables and pork that’s been seared just right. The vegetables go into the pan to cook, and then when they’re ready, the pork goes in. An easy homemade teriyaki sauce goes over the top and dinner time is ready. If you aren’t partial to the vegetables I have included, that’s perfectly ok. There is nothing wrong with customizing this dish to match your tastes and preferences. There are quite a few delicious vegetables that would pair well with this dish. If you want a little tropical flavor to your teriyaki pork, toss in some pineapple which will also add a bit of sweetness to the dish. This recipe calls for pork tenderloin. You can either cut your pork into 1-inch cubes or thinly slice it. I would suggest partially freezing it if you choose to thinly slice it as this makes the job so much easier. WHAT IS TERIYAKI SAUCE MADE OUT OF? Teriyaki sauce ingredients can vary depending on whether it’s homemade or store bought. However, traditional teriyaki sauce usually contains four main ingredients which include soy sauce, sweetener, ginger, and garlic. Other common additions are sake, rice wine vinegar and sesame oil. IS PORK LOIN AND PORK TENDERLOIN THE SAME THING? Though the names can be deceivingly similar, these two cuts of meat are not the same thing. Pork tenderloin is thin and small which is why it’s perfect for this teriyaki pork dish. Pork loin is actually much larger and can even have steaks cut from it, depending on the size. 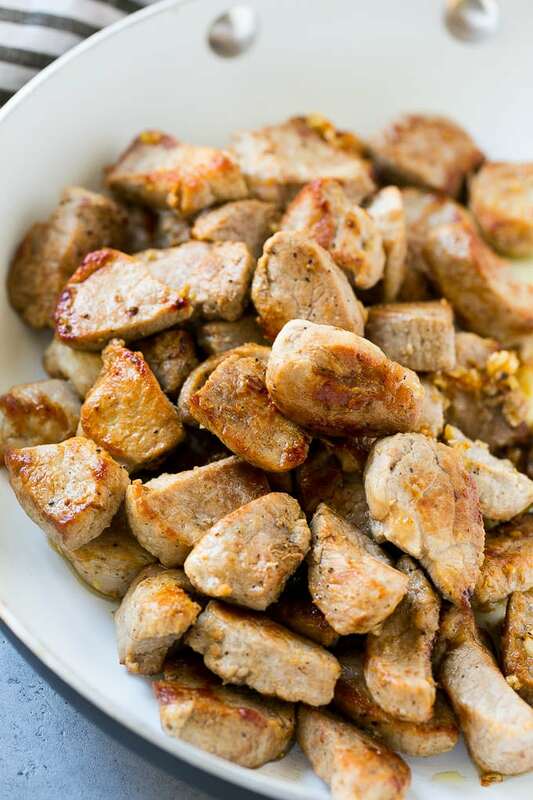 Pork tenderloin stays tender when cooked, which makes it ideal for stir fry. I think the reason I love making stir fry so much is because it’s so easy, especially if you’re having to throw a dinner together last minute. I usually just use whatever vegetables or meat I have on hand and always come out with great results. Pork stir fry is a delicious go-to dinner for any day of the week and I’ll definitely be making it again soon. 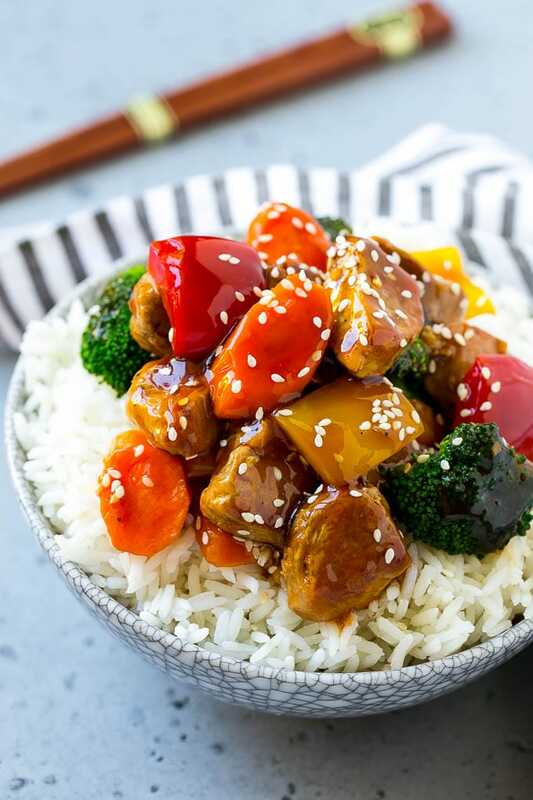 This teriyaki pork stir fry is pork tenderloin seared to perfection with colorful vegetables in a homemade teriyaki sauce. A fresh and healthy meal that's ready in just 30 minutes. Heat 1 teaspoon of the oil in a large pan over medium high heat. 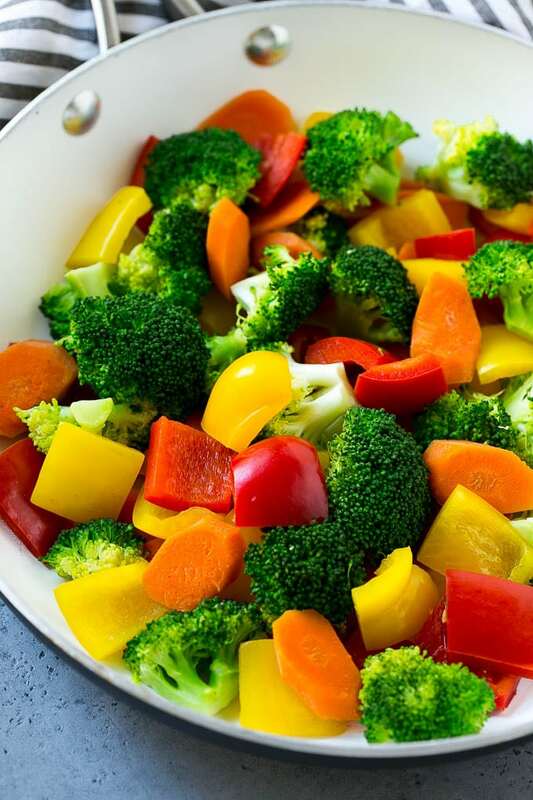 Add the broccoli, peppers and carrots, and cook for 4-6 minutes until softened and lightly browned. Season to taste with salt and pepper. Add the remaining 2 teaspoons of oil to the pan. Add the pork, then season with salt and pepper to taste. Cook, stirring occasionally, until the meat is browned and cooked through, 4-6 minutes. While the pork is cooking, make the sauce. Place the soy sauce, water, brown sugar, honey and sesame oil in a small pot over medium high heat. Stir until sugar is dissolved, about 3 minutes. Turn up heat to high and bring to a boil. Add the vegetables back to the pan with the pork. Pour in the sauce and toss to coat. Sprinkle with sesame seeds, then serve. Made this tonight for the family–it was delicious! I wouldn’t change a thing. Thank you! We love stir fry! I’m excited ti make this because of all the vegetables which we are trying to add more to our diet. This looks so good. I love teriaki and pork! I am definitely going to try this recipe. Oh, how I love stir fry so much. Thanks for the recipe. Pinning for later. I had a dozen leftover pork chops (thin sliced) which is tried a ‘milk and mustard gravy pork chop recipe a couple of days ago. Needless to say THAT didn’t get eaten so what to do with all the leftover chops? Washed the gravy off those babies, cut off the fat, cubed and put in this delicious recipe. Used carrot straws asparagus and yellow bell pep as in hand. So glad to hear you enjoyed this recipe, thank you for reporting back! 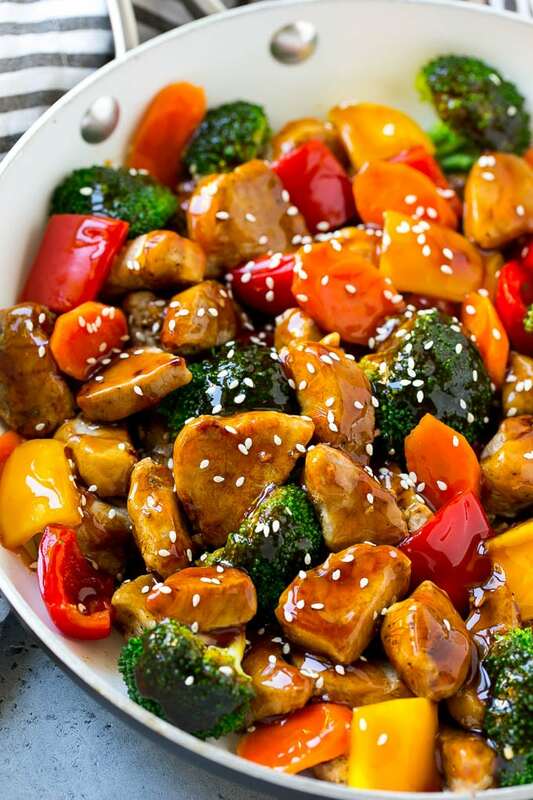 One of the things that I love about stir fry is that it’s so easy to make! It’s also such a versatile recipe because you can add or remove whichever ingredients you want! This looks so good and it’s perfect with rice! I love a good stir fry and this one sounds really good!! Thanks for this recipe! My kind of dish, yes please! I love anything teriyaki and this looks absolutely delicious. This dish looks so colorful, it would be the center of attention on any table. My husband loves pork and I know he’d love to give this dish a try. Stir fry is one of my favorite foods! Teriyaki is one of my favorite sauces… so this is like heaven to me! I can’t wait to make it! I love a good stir fry. I like to make them several times a month for dinner, so I’ll add this to my list. I’m sure it’ll be a hit for everyone in my family. Stir fry is popular around here. We make it at least once per week. Now I want to try to make it with pork. It looks delicious! Stir fry is popular around here. We make it at least once per week. Now I want to try to make it with pork. Looks delicious! With all the hours my husband has been putting in at work I think I will make this for my son and I and we can do a Movie night and I will make extra so my husband would have something to eat once he does get home. I’m getting so hungry looking at these photos! I love a good pork stirfry, especially when it has all these delicious ingredients. The sesame seeds put it over the top! Looks so delicious! This recipe looks really yummy. It would be perfect to add to our menu plan for next week.